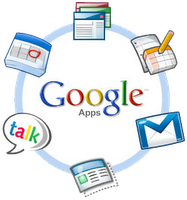 Google Apps is one of the leading cloud services on the web, offering mail, calendar, contacts, documents, and many more applications. We have solid experience in migrating services to the Google cloud, either via the free Google Apps offering, or the premier Google Apps offering for business. We recommend using Google Apps for all your email, whether you have a hosting package with us or not. We are able to work with you to make the necessary configuration changes to your DNS records (subject to access and permissions) and email delivery routes to enable your all your email services within the Google cloud. With experience of migrating many, many clients to Google Apps, we are excellently positioned to assist you with a new service linked to a domain name of your choice, or an existing service to move all your services away from in-house, saving you money and making your operation more streamlined and cost-effective. We also use Google Apps for all of our services. Contact us to discuss your current situation and we will see how we can help.